Most families are complicated, and when two people decide to marry, they face important questions involving their relatives. A wedding brings two of these complex and sometimes messy family systems into relationship with each other. Because families have histories, traditions and sometimes also misunderstandings or feuds, navigating your wedding planning with key family members in mind can require a lot of thought and energy. Planning a wedding is one of the first major joint projects a lot of couples take on together, and by communicating honestly and compassionately with each other, they can build strength and confidence. When people of different faiths marry, sometimes the interfaith aspect of the wedding adds more layers of complexity, and sometimes disagreements with family members about faith issues mask or distort other underlying family issues. Chart out your extended families together and identify where the challenges are. If the challenges include issues related to your being an interfaith couple, make a note of that. Remember to also identify strengths within your families. Who are the relatives who could potentially help you navigate a tricky family situation? Who could you ask to be in your corner for advice? Gabrielle Kaplan-Mayer, the author of The Creative Jewish Wedding Book, encourages couples to think of the talents and creative skills their relatives have to offer, and, based on those skills, come up with projects that are part of the wedding itself. Baking, singing, jewelry making, embroidery, quilting and even puppetry can all be woven into a creative wedding ceremony or a festive meal following a wedding. If you know you have relatives with complex or conflicted feelings about your interfaith wedding, sometimes inviting them to contribute something to your wedding based on a talent of theirs can help create an emotional opening for them. If you are “blending” families and bringing children from previous relationships into your marriage, it’s important to offer meaningful opportunities for them to participate in the planning of your wedding and the ceremony itself. Pinterest has a great collection of ideas for including kids from previous relationships in weddings. 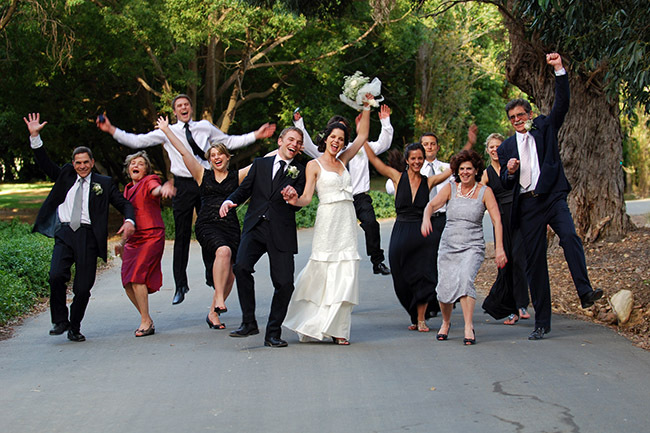 Some family members can’t help but want to take control of your wedding. One strategy that sometimes creates a “win-win” in these situations is to offer to let this family member be in charge of a part of your wedding that isn’t centrally important to you. InterfaithFamily has a great personal story describing a couple faced with a Jewish grandmother who was not initially accepting of their interfaith wedding, and who planned to skip it. Having her be present was deeply important to the couple. Accepting that they couldn’t make her feelings change, they sought out repeated opportunities to spend time with her, and the partner who wasn’t Jewish went on a charm offensive that ultimately worked. Sometimes being wanted and being loved patiently shifts the heart. Sometimes not. But sometimes it’s worth a try. And remember, even a relative who doesn’t attend a wedding can have a shift in feelings later. Rabbi Julie Greenberg writes, “Families are constantly re-configuring.” Cultivating acceptance, openness and compassionate understanding for the different ways family members initially respond to big changes in their families is good life prep for the greater reality that family life will bring many emotionally layered changes throughout your lives. Of course, even though patience and acceptance often help soothe family conflicts, sometimes it’s important for couples to set boundaries with difficult family members. Humility is a good human quality, but humility is not the same as humiliation. If you face relatives who treat either of you with deliberate malice, or who seek to embarrass or shame either of you, sometimes the healthy thing to do is decide not to continue being treated that way. That might involve both of you respectfully telling the person how you feel or it might involve distancing yourselves. These are painful decisions. One of the most important things interfaith (or any) couples can do for each other is make their dignity and emotional security their top priority. Flexigidity is a term coined by Gidi Grinstein, and it basically means what it sounds like: the quality of being flexible about some things and rigid about other things at the same time. Couples who can work as a team to determine what they’re willing to be flexible about and what they need to be firm about will find that that skill set is important for family life in general, and especially helpful in planning a wedding!